The artist Rokni Haerizadeh takes ancient Iranian narratives and poems, as found in the likes of miniature paintings, and revisits them, often injecting them with new life. In Haerizadeh’s unique vision, miniatures contain plastic bath ducks, urban icons and imaginary characters (for example, a superhero wrestler made of cotton called pahlevan e pambeh). His mixing of figures from the past and the pre­ sent is often more sophisticated than any standard, easy use of contrast one sees among many contemporary artists working today; they’re drawn from an internal map of references that is both of and about contemporary Iran’s paradoxes. Funny colloquial titles are drawn from the Iranian oral tradition. The works are playful, confusing time and space. Finally, they challenge traces of elitism in the tradition of Iranian arts; they actually make you laugh. In his most recent exhibition at Tehran’s Golestan Gallery, Haerizadeh continued this vein of work and took on the still life. Peaches, carrots, eggplants, nectarines, Iran Air airplanes, images of former ruler Naser-el-din Shah and Iranian poet/prophet Sadegh Hedayat, and antique trays and plates all featured, in plain shades of purple, red, and yellow. These were paintings made in the fashion of quick script — spontaneously executed. 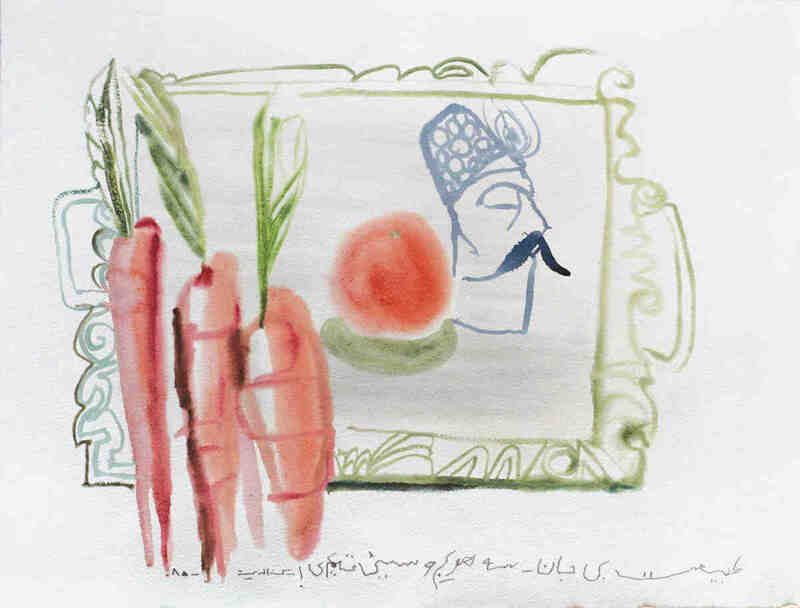 In his still lifes, Haerizadeh played with the idea of the framed subject; the same lines that outlined peaches and nectarines developed and created a second frame for the subject. Or were the still lifes actually, simply, the subject themselves? One can never tell. Perhaps, Haerizadeh seemed to be offering, Magritte’s pipe was in fact a pipe after all. Haerizadeh’s control of his medium is subtle. His colorful, joyful compositions seduce us — for they are very beautiful. But underneath, you could say a bit like a shifting frame, is a hint of irony, even subversion — not unlike the layers and layers of tone and meaning that constitute life in Tehran these days.